Ok ! So it’s time for me to collect another award. 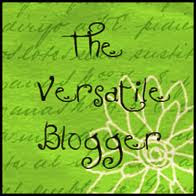 :D This time, Sunil & Preethika, a wonderful blogging couple, have generously shared the Versatile Blogger Award with me. It is rather a tag-award with the following set of rules. Though I had already done a similar post about ‘Seven random facts about myself’ earlier, I was wondering about what to write this time. But suddenly I remembered a short note which my school friend Kaddu wrote and posted on Facebook on my last Birthday. Kaddu was the one who actually pushed me into the blogging world. So, here I’m sharing that nice little note which she wrote. 1. On phone, he laughs more than he talks. 2. He has not yet been able to figure out why people drink tea... and enjoy it too! 3. If a damsel and a dog were in distress in front of him, he would probably save the dog first! 5. Mornings and Shobhit are NOT synonymous with each other! 7. He's a fan of Tintin, Asterix and Archies! I just cannot make up my mind in selecting gifts or greeting cards. Now that I’m done with the difficult and rather boring task of writing about myself, it’s time to share the award with some of my fellow bloggers whom I discovered recently. Hey, thank you so much buddy...this is indeed special. Nonetheless, thanks a lot, i enjoy reading your write-ups too. Thanks for the award Shobhit. High time you changed to gtalk. I find the voice clarity in gtalk better than Yahoo's. I will take up this tag soon. I had something similar here. Not sure if you have seen that post. Ditto! About the whole tea hating thing. I hate its taste and i hate it in any form, ice tea or otherwise. Bumped into ur blog via Soumyas blogpost.gonna stalk you sir! And MAJOR respect for saving the dog first. MAJOR.